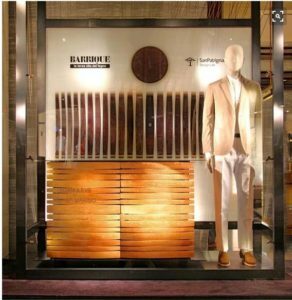 During the Salone del Mobile 2016, Ermenegildo Zegna, in collaboration with San Patrignano, Gian Marco and Letizia Moratti, presented Adam & Eve by Peter Marino, a new chapter of the project Barrique, the third life of wood. Founded in 2012 with the purpose of supporting the recovering path of the young people of San Patrignano by breathing new life into recyclable wood, the project has grown over time into a permanent collection of over 46 pieces, eachdesigned by a renowned designer or architect. For the 2016 edition, the internationally acclaimed architect Peter Marino created a cabinet named Adam & Eve, which will enrich the collection of items made by the San Patrignano Carpentry Shop. Peter Marino has been collaborating with the weaving and decoration departments of San Patrignano since the 1980s and has now donated his creativity to the project Barrique, the third life of wood, thus renewing his support to the community.The project strenghtens the social and human value of the collaboration between Fondazione Zegna and the community of San Patrignano, which began in 2012 within the weaving department. Hand weaving is one of the old artisanal trades that has been taught in the community for over 30 years and Fondazione Zegna is supporting this workshop by sharing its valued know-how in the field.